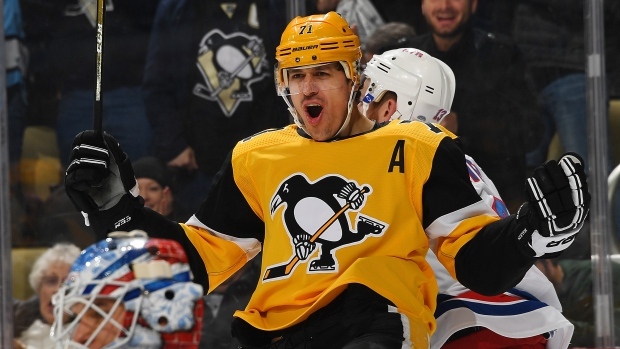 PITTSBURGH — The Pittsburgh Penguins survived a four-minute penalty kill and went on the hunt against the New York Rangers. Defencemen Marcus Pettersson and Brian Dumoulin also scored for the Penguins (31-21-7), who leapfrogged the Carolina Hurricanes for the second Eastern Conference wild-card spot. "At the beginning of the third, getting that kill, it gave us such a boost," Letang said. "And then we got a bunch of goals." "He tends to be a guy who builds confidence when he scores, and so I think that bodes well for us and for him," Penguins coach Mike Sullivan said. "He's an elite player ... and you could see it in the third period tonight, the kind of impact he can have." "We got demoralized," Rangers coach David Quinn said, "and they got a new set of energy and a new lift and the whole complexion of the game changed." Crosby had three assists to give him 11 points in his past five games for the Penguins, who had won just seven of their previous 17 games to fall in danger of missing the post-season for the first time since 2005-06. It was the first time all season the Penguins got four goals from defencemen. "The last couple games we have been really active getting chances," Dumoulin said. "Except for those five or six minutes there in the third, I think we played a good game," Zuccarello said. "Obviously, it's a good team over there. They have good forwards. They're going to get some chances, but I think we created a bunch of good chances. "It could've gone either way. It's hard when they score three right away — boom, boom, boom."